Can you believe the difference?! You may have seen this before when I shared it at My Repurposed Life. Let me show you how I did this in three easy steps! 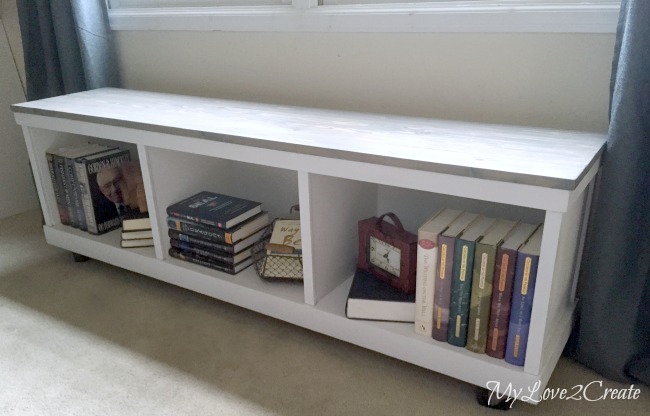 To start, you will need a cheap piece of laminate furniture. 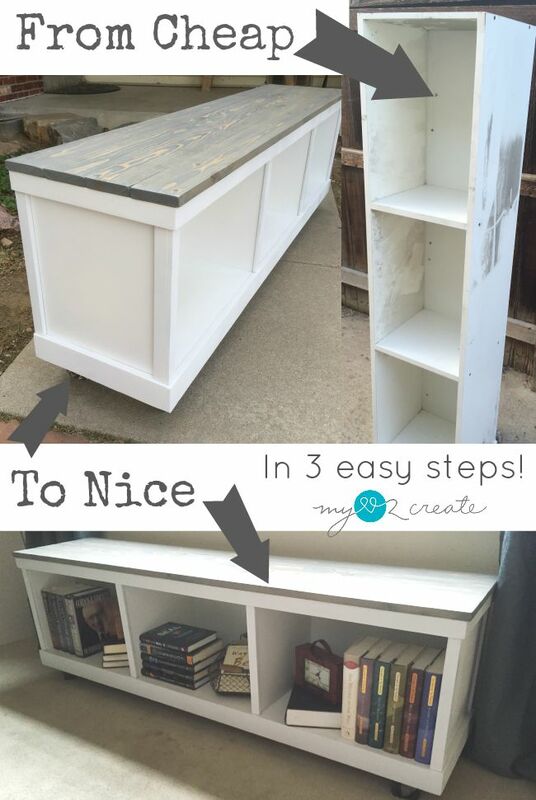 If you don't have one already, then just pop onto the free section of craig's list (or if you live in Utah, the free section of KSL, I found this out while doing my sister's Closet/Laundry Room Makeover). Step 1- Beef up the top and the bottom with 2x4's or scrap wood. I decided to turn this cabinet into a storage bench. I knew I wanted to have trim on the top and the bottom, but I wanted the bottom trim to be thicker, so I added scrap 2x4's to the bottom and scrap pieces of 3/4 inch thick wood to the top. I simply glued and nailed them on, making sure to cover all the edges. Step 2- Add trim to top, bottom, and all exposed edges. This is the fun part, now you get to add trim! Basically this step is hiding what you added in step one and covering the edges of the laminate furniture. It is what makes it look nice and finished. For my bottom trim I used a 1x3, since it was thick enough to cover the 2x4's I had added as well as the 3/4 part of the cabinet. Since I only used 3/4 inch scrap on the top, I used a 1x2 to trim it out, which is 1 1/2 inches thick. Then I used scrap wood 1x1's to cover up the rest of the exposed edges on the front and sides. I just used glue and my Ryobi Nail Gun to attach all my trim. Step 3- Add a top! Adding a nice top is your final step and you can do it any way you want. I choose to build mine with 1x4 furring strips. 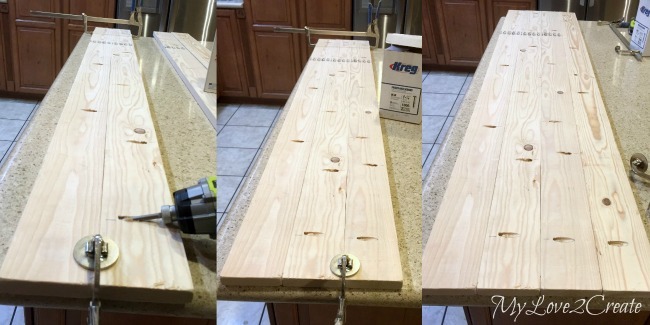 I used my Kreg K5 Pocket-Hole Jig , to drill pocket holes and then attached all the boards together to make a top. Which was attached to the storage bench after I painted and stained, with glue and finish nails. 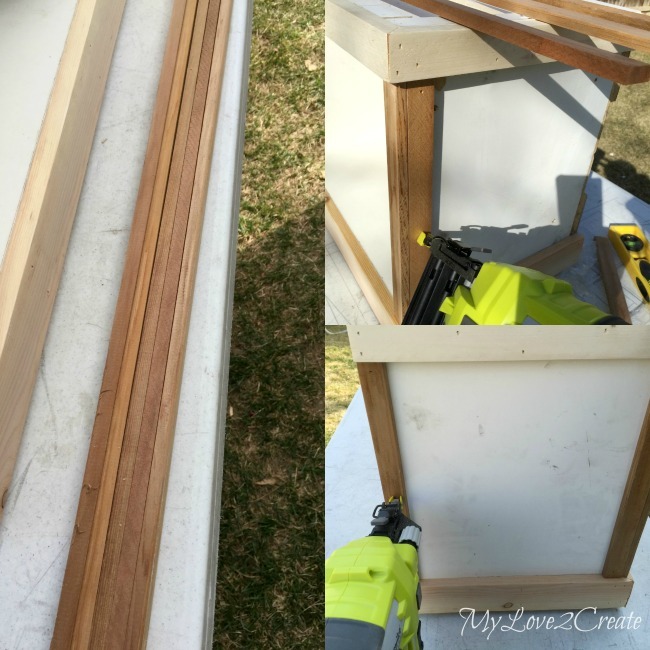 You could used bigger planks of wood, or even plywood for your top. If you do use plywood I suggest you use Edge Banding to cover the exposed edges. 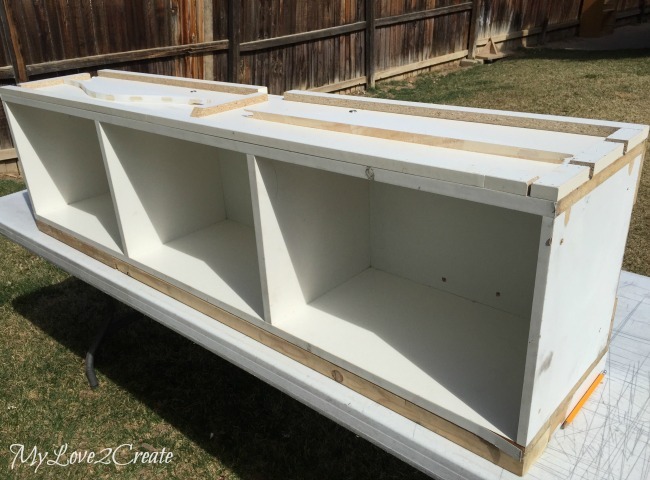 I used it on my Farmhouse Storage Bed, and loved it! After some paint, stain/poly, and casters on the bottom this is the final result! So pretty! 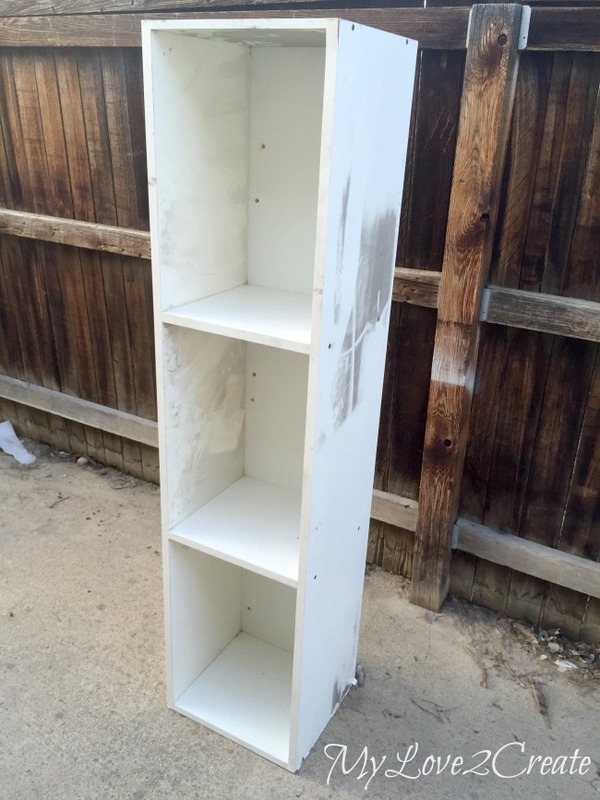 The trim hides all the ugly parts and leaves you with a very nice piece of furniture! For a little bit of effort, I would say it is totally worth it! Right?! Not to mention all that storage, and it is a great place to sit as well! For a full picture tutorial and more details on this transformation visit my original contributor post. 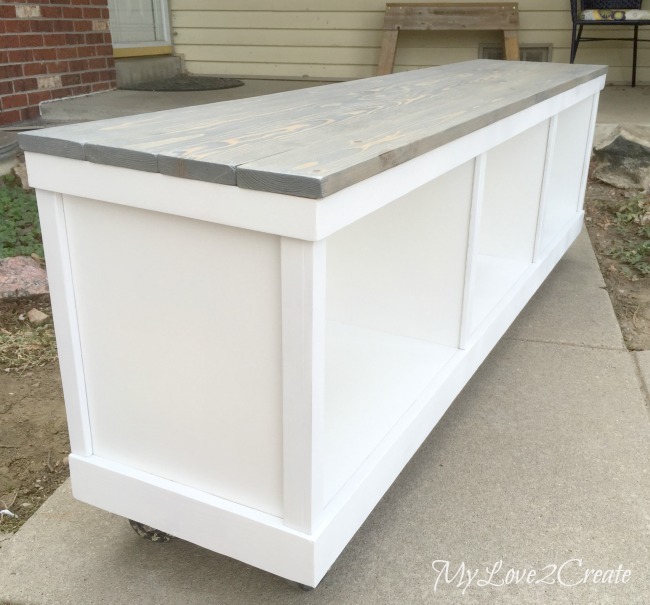 *Update: You can also check out the fun pallet crates I made to go in this bench! I love making something old new again! How about you? 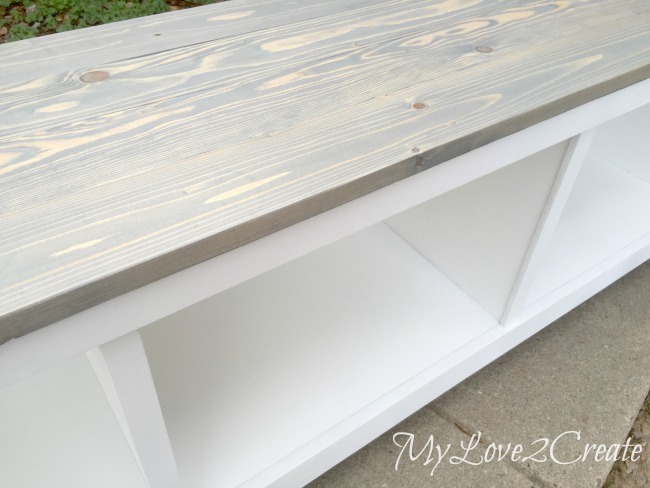 Do you have an ugly piece of laminate furniture you could attempt this with? Or have you done your own transformation? I would love to hear about it! I love how it turned out!! I have some cheap laminate furniture in quite bad shape so I'll try it. Pinned for then, thanks for sharing!! It looks great nothing like it's former self! Oh, I pinned this. What a great idea! You make it look so easy. 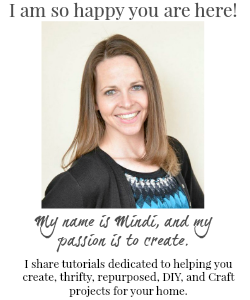 Hey Mindi, I love this storage project. No we aren't 100 % back on a schedule yet. Sammie is trying out for Volleyball team and we just got her Piano schedule. I am so excited for fall. But, hoping it cools down we have had temps higher than summer 105-108 whew! Can't come quick enough for us. ;) Pinned & shared. Thanks for joining the party! Happy Fall! You did a wonderful job. I love it! Shoot ... I just passed up some laminate furniture at a garage sale!! What a great project -- pinning! Thanks for sharing! Beautiful! Thanks for sharing with us at WTDW's party! Great transformation. What a transformation! Thanks for the tutorial. Pinned! What an incredible transformation!! Thanks for linking up at Best of the Weekend. Pinning this to remember where I saw it when needed. great makeover. 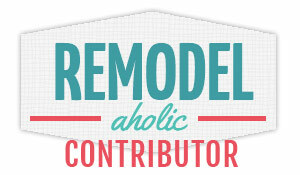 Awesome project, love the stained wood addition. Just recently made a small box using gray and that color is really grabbing my attention this fall. Adorable! Love it! You make it look too easy! Did you never the corner pieces? Love how you beefed it up with the trim and the top is gorgeous. Great job! Thanks for sharing with SYC. Very nice!! Now can you show me something clever to do with one of those silly laminate computer desks with the slide out space for the key board and compartment s that pretend to be organizing spots? Thank you for sharing. You kickstarted my thinker! No doubt about it. It's gorgeous!! This is adorable. I actually have some pieces I want to use for the new nursery, mainly for storage, but giving them a quick revamp will definitely make them look nicer and sturdier too. Thanks for sharing! Great tutorial and wonderful result on the storage unit. Thank you for sharing with the Clever Chicks Blog Hop! I hope you’ll join us again next week!